Zipit backpacks are durable, roomy and comfortable to carry around. But above all, they offer something that other brands don’t… personality! With their dazzling bright colours, eye-catching patterns and of course — the trademarked Zipit faces — you’re sure to turn heads with a Zipit backpack. The product range considers all ages, sizes, genders and needs. There’s something for everyone. Inspired by Zipit’s Original Pencil Case, this brightly coloured backpack includes the classic “all-zip” design. 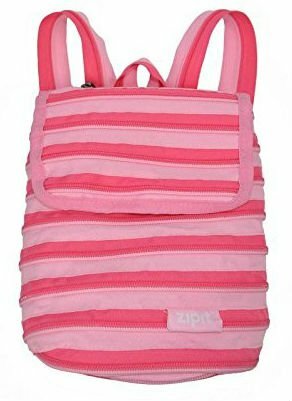 This is one of the smaller Zipit backpacks on offer, making it a more comfortable alternative to a handbag. It’s perfect for stylishly carrying around a purse, or a collection of other small items. The backpack’s high-quality materials reflect its neat, nimble design. Made from 100% polyester it’s soft to the touch, yet very sturdy and robust. For so much originality, the price for the mini backpack is still only £15.71. Now this one makes a real statement! In fact, all 8 futuristic designs in the ‘Hard Shell’ range are equally mind-blowing. What I really love about the Hard Shell Zipit backpacks is that they’ve been designed with practicality in mind, too. Firstly, you need not worry about damaging your expensive laptop or other valuable items. They’re very well-protected by the tough outer shell. Furthermore, this backpack is equipped with extra padding on the back and shoulders. This reduces the stress or discomfort experienced from carrying around those heavy items. Despite the wonderful exterior I still think the coolest feature is inside the backpack. When you open up it up there’s compartments for arranging just about everything. You no longer need to chuck things in at random, as you’ve got the option to keep your stuff well-organised. You might, for example, separate electronics or paperwork from your lunch. The blue triangles hard shell radiates quality both inside & out. It costs just £43.76. Just when you started think Zipit Backpacks were all about funky bright designs & patterns, they go and bring a subtle design to product range. The Zipit Reflector Student Backpack compromises on ‘loudness’ — but certainly not on quality or originality. Most original about this Zipit Backpack is its horizontal zipper halfway down. This opens out to reveal a reflective strip to increase visibility. Student cyclists are therefore safer on the roads to and from their School, College or University. Much like the practical ‘Hard Shell’ range, the Reflector Student Backpack is also equipped with a compartment organiser amongst its bright reflective interior. The unique combination of safety and practicality offered by the Reflector Student backpack costs an affordable £34.32. 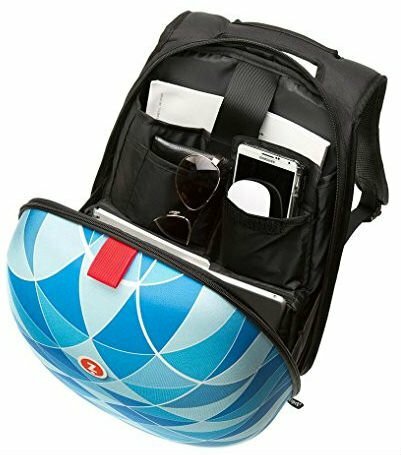 It wouldn’t be representative of the Zipit brand if I didn’t mention a backpack with some attitude. The Men’s Grillz Backpack takes on a personality of its own… and you wouldn’t mess with it! 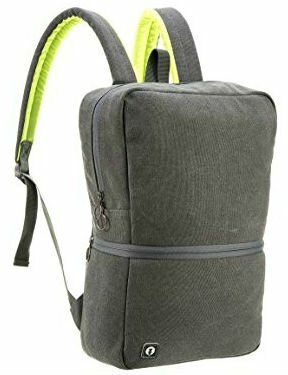 This Zipit backpack comes in 5 different designs. Two are camouflaged, the others are coloured. In addition, there’s also a smaller kids version in black/florescent. So nobody misses out on this one. Every Grillz Backpack’s contains a large pocket under the hood, and small one behind the mouth. Each of these Zipit backpacks have a padded back and padded adjustable straps — so it’s not just a pretty face. 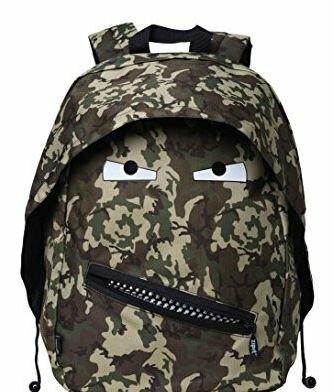 The Zipit Men’s Grillz Backpack Camo Green backpack is £24.88.